<br>A long-dormant evil emerges from the caves of Mars, unleashing Armageddon on the planet's colonists. 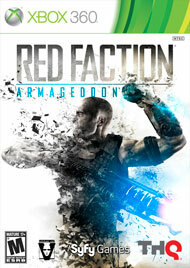 With this force stopping at nothing to cleanse the planet of life, mankind finds itself poised on the brink of extinction.Red Faction: Armageddon expands on the critically acclaimed, best-selling franchise with new, groundbreaking challenges. You are humanity's last hope for survival.